This small workshop and the people behind it are the true pioneers of the racing cars. Now you have the possibility to visit them with our guided tours in English. Everyone is familiar with motors in Modena. They can instantly recognize a Guzzi 500 Astore and tell the difference between that motorcycle and the similar Guzzi Falcone: the first features a telescopic fork while the latter has a pantograph fork. The Motorvalley coincides with Via Emilia; the Stanguellini Museum, a historic automobile shrine, is located right in central Modena, the land of tortellini, motors and beautiful girls. The Stanguellini Museum is managed by Vittorio Stanguellini’s son, Francesco, a true car addicted. Pioneer of the Motorvalley, Vittorio Stanguellini was the first one to produce cars, thought they were small displacement engine vehicles. After him, Ferrari and the Maserati brothers started building cars as well. And Stanguellini’s tradition carries on. Francesco and Simone, father and son, both have the same passion. Simone is the fourth generation of the Stanguellini family, the first being his great grandfather, Francesco. Francesco says the first ever Modena registered vehicle belonged to his grandfather, who was called Francesco just like him. In the Stanguellini household, even toys are homemade and equipped with an engine. For example, a Maserati toy car that was Francesco’s first toy ever. It still works and has a gearbox consisting of three gears, with suspension bouncing like that of a real car. Francesco grew up around cars, with the smell of castor oil and gasoline, so he has a really strong bond with them. In the 60s, his father designed the Stanguellini Junior, Lorenzo Bandini’s and Juan Manuel Fangio’s race car. Regulations required the engine to derive from a mass-produced vehicle: the engine of the Stanguellini Junior derived from the 1110 Fiat, but it was three times more powerful. It was equipped with Weber carburetors, which were also produced in Emilia Romagna, precisely in the most popular carburetor “factory” in the world, Bologna. So, it featured an updated mass-produced engine which was assembled on a specially designed frame. The frame was drilled in order to lighten the car without weakening it. They didn’t have actual designers: the models were produced from simple sketches. The shape of the car was made of steel bars, and the metal sheets were then attached to it to create the body of the car. To test the aerodynamics, they fixed a woollen thread to the body, using a hair dryer to check whether it would stay still or not. Francesco’s father was self-taught; he wasn’t an engineer, as the profession of engineer didn’t yet exist in his time. Even Ferrari, a true genius, earned his engineering degree when he was 62. “Building these cars was mostly something that came from the heart,” Francesco says. And while sipping Lambrusco, they came up with world record-breaking ideas: the Stanguellini Guzzi Colibrì (featuring a 250 cc engine) broke six records at Monza in 1963. Its engine was similar to that of the Guzzi 500 Astore. Running 100 km, it reached an average of 164 km/h; for a car with a 250 cc engine that was the best performance ever. The Stanguellini Colibrì was an innovative concept: its wheel would later be used in modern Formula One cars. What catches the eye is the aesthetics: these cars are amazing in terms of design. And their beauty is related to their aerodynamic line. It’s hard for Francesco to point out which vehicle is the family jewel; the car he’s most fond of is the one his son drives, a model he’s always wished to drive himself. Once races were extremely dangerous (drivers often got killed in a car accidents) so Francesco’s father never let his son drive. But Francesco chose not to do the same: “nowadays driving on the track is much safer than driving on the road”. Simone drives on the track: he raced at Monte Carlo, Goodwood, the greatest classic car races in the world. There’s also a small race department Francesco and his workers go to after office hours, a place he calls his “arcade room”. They’re currently building a new aluminum body for a 1100 Bialbero, proving Italians are still able to create perfect things, after all this time. Even there, there’s no engineers, just a big passion. Like Valentino’s passion: he makes the engines, choosing the appropriate horsepower. Like Giorgio’s passion: his job is to build auto parts. He still works on lathes and milling machines. They’re artists, people with motors running through their veins. 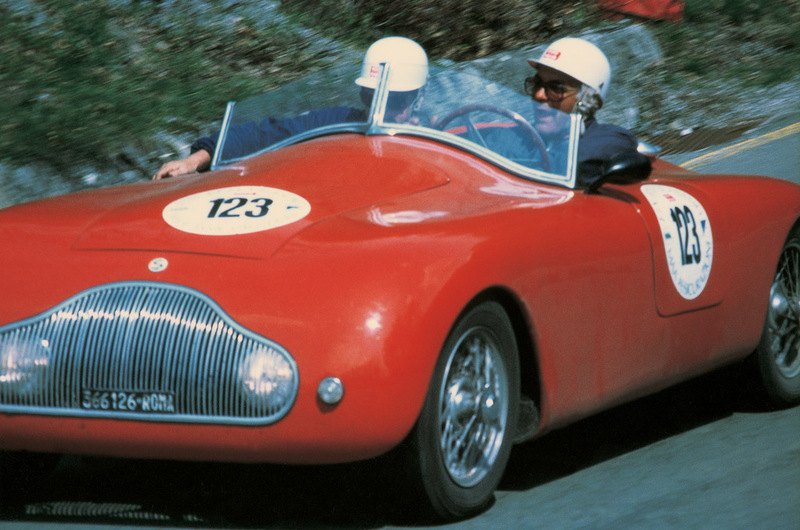 They’ve been working for Stanguellini for a long time, and they live for their work, it’s their greatest fulfillment. In Francesco’s opinion, thanks to museums people can learn to love things. In the case of the Stanguellini Museum, we can learn to love cars, but in general, to protect our own heritage. This is the heritage of the Motorvalley; visiting the Stanguellini Museum you can perceive its history.